One of the most frustrating times of the year when it comes to fashion is this current Winter/Spring transition we are in. In the state of Texas where I live, there are days where I swear we have four seasons pop up in one week or even one day. Two days ago I was in a maxi dress and sandals, soaking up the sun and loving every single minute of it. As I currently look out my window from my office our roads, cars, trees and houses are covered in a sheet of ice and my three children are blissfully sleeping late due to a 2-hour school delay. Crazy making right? So how is a girl to dress? Layers, layers, layers. 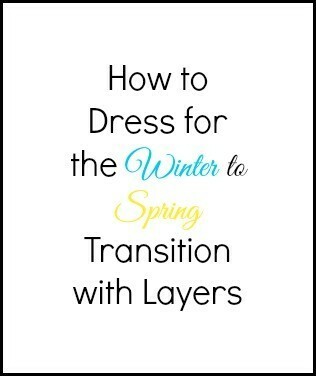 I personally love dressing in layers and this is something you can get so creative with. I never get bored coming up with different combinations when it comes to what I can layer with what, as well as pattern and color combinations. It’s fun! Make it a game and don’t let Mother Nature drag you down. Amazon Fashion featured these two outfit ideas and lightweight jackets, which you can wear over sweaters when the weather is cold and later over tanks as the days are warm, but the nights cool. You can shop these lightweight jackets here. As you can see, you have tons of choices when it comes to layering a simple lightweight jacket. Are you ready for more layering tips for the winter/spring transition? Perfect. Stay tuned! If you have any question, don’t hesitate to ask in the comments or email me at julie@momfabulous.com.